The day didn’t start that remarkable. 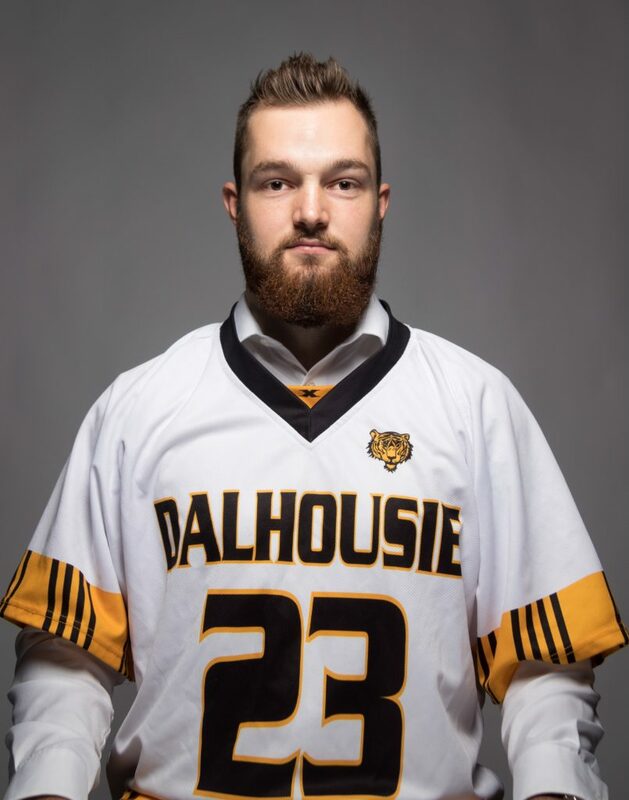 Dalhousie University lacrosse player, Sawyer Howell, was at home with his roommates watching Planet Earth season two on Netflix on Sept. 26. The National Lacrosse League draft was taking place and Howell was following it on his phone because he had a few friends that were drafted in the first round. As the draft moved on, Howell stopped tracking it and turned his attention to the show. Twenty minutes later he checked his phone again and saw many congratulations messages. The Georgia Swarm drafted Howell in the last round of the draft; seventy-first overall. Photo by Geoff Richards Photography. Howell wasn’t expecting this. He didn’t go to any of the draft combines this year because he was in Halifax and the closest combine was in Toronto. His plan was to re-declare for the draft next year, train all summer and go to the combine while he’d be back in his hometown, Toronto. But Georgia went to watch Howell play last summer for the Mimico Mountaineers in Junior A lacrosse. They liked what they saw and drafted him. The Swarm’s training camp starts on Nov. 2 in Toronto and takes place over the next three weekends. Howell had just over a month to prepare. He goes to the gym twice a day, including days he has practice with Dalhousie. At home, he studies Georgia’s strategy. Howell’s biggest fear is to go into training camp and realize he should have done more preparation. In his last season with Mimico, he had one goal: three assists for four points. He’s a defender and defenders rarely score, so his stats aren’t a good indication of how good he is. According to the Dal Tigers Head Coach, Connor Dubreuil, what makes Howell a great player is his work ethic, preparation and intelligence. Dubreuil says when the coaching staff draws up plays, Howell can grasp it quickly and leads the team in implementing them on the field. Howell is feeling excited and nervous heading into training camp. As a defender, he may have to play against Lyle Thompson in drills. Thompson led the NLL with 116 points in 2017. “My team has so many guys I have looked up to my whole life, Lyle Thompson is like the best player in the league right now,” says Howell. As the last player drafted by the Swarm, Howell doesn’t know his chances of making Swarm’s team. But he’s not letting that discourage him. Jeremie Baumeister is the Dal lacrosse team co-president and defender. Howell started lacrosse late, at the age of 12. He says he has never been the most skilled but he is always willing to work hard and that is what has helped him. Baumeister says Howell “lives for the sport.” When someone brings lacrosse up, Howell asks if anyone wants to go pass the ball around or practice shooting. Having the Dal team to train and play with is helping Howell stay in game-shape. Howell’s first exhibition game will be in Toronto against the Toronto Rock. Many friends and family will be in attendance. He’s excited to play against his hometown team and against a few friends who will be on Toronto’s roster. With Halifax getting a lacrosse team in two years, Dubreuil is hopeful Howell will play for that team at some point.